MANILA, Philippines - ACET results are out! The decisions for the freshman applicants who took the 2017 Ateneo de Manila University (ADMU) College Entrance Test for AY 2018-2019 are already posted at the ADMU Blue Eagle Gym and officially released online at 11:30 in the morning today, January 6, 2018. 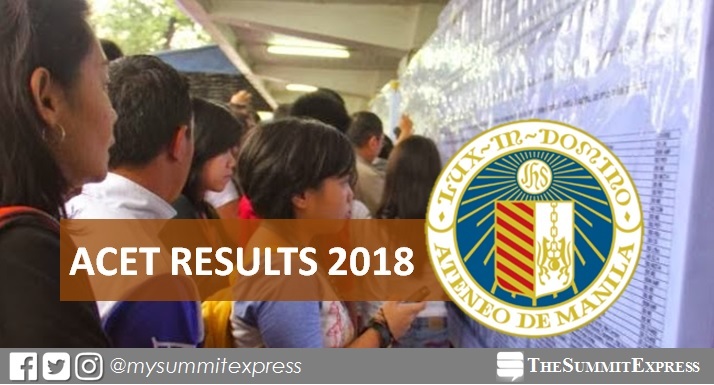 The first batch of ACET 2017 was administered on September 23 and 24, 2017 at the Ateneo High School, Ateneo Grade School and Xavier School test site. On Friday night, Ateneo posted at the Blue Eagle Gym those who qualified as Freshman Merit Scholars and San Ignacio de Loyola Merit Scholars. In addition, the Facebook page of the Athens Tutorial and Review Center also captured the results pages which were shared online. Ateneo also accepted applicants from Doha, Qatar; Dubai, United Arab Emirates and Riyadh, Saudi Arabia in October last year. Meanwhile, the examination for the second ACET for SY 2018-2019 is set on Saturday, January 13, 2018.